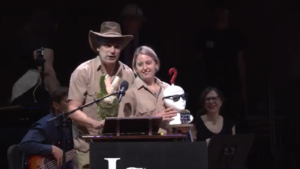 The 2017 Ig Nobel Prize awards ceremony was held September 14 at Harvard University. The ceremony honored ten real scientists who have done something that makes people laugh and then makes them think. 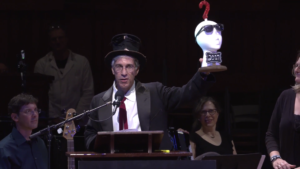 The theme for 2017 was “Uncertainty.” The festivities included the traditional paper airplane deluge, “Welcome, Welcome” speech, introductions of Ig Nobel and Nobel laureates, the actual awards, mini-lectures and science demonstrations, and an original mini-opera entitled “The Incompetence Opera.” The Boston Typewriter Orchestra entertained the audience with a pre-ceremony mini-concert. 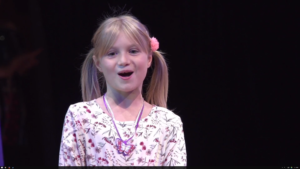 Miss Sweetiepoo tells speakers she’s bored (insistently) when they talk too long. Winners of the Igs attend the ceremony at their own expense, but they do get prizes! This year’s prizes included the Ig Nobel Prize, a piece of paper certifying the award (signed by Nobel laureates), and 10 trillion dollars (Zimbabwe dollars, so not quite as exciting as it sounds). The “prize” was a tropy in the shape of a human head, wearing sunglasses, and adorned with a question mark (uncertainty). Who knew? Handling a reptile increases your willingness to gamble.